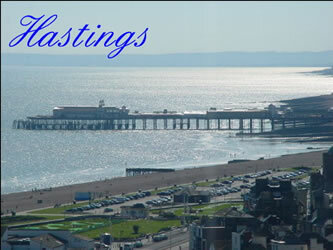 The official name of the town is Hastings & St Leonards. It is a small friendly seaside town. By train: 1.5 hours from Charing Cross station (or 2 hours from Victoria station). Cheap Day Return ticket (off-peak) with Young Person's Railcard (2002): £12.20. Language schools: 8 schools which are recognised by the British Council (2002). A complete list of local language schools can be found at http://www.hastings.gov.uk/language_schools. About 35,000 students come to Hastings each year to study English. - William the Conqueror brought an army from Normandy (in northern France) and defeated King Harold at the Battle of Hastings in 1066 (this is the most famous date in English history). The local area is known as "1066 country". 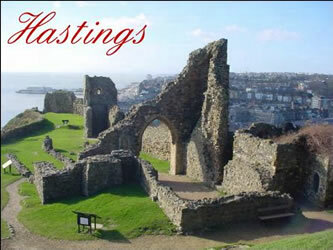 You can visit the ruins of Hastings Castle (but you have to pay to enter). 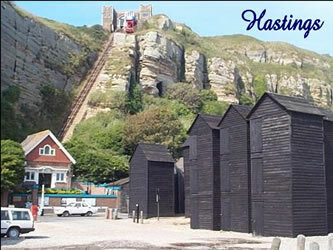 - Hastings is a popular seaside resort surrounded by hills. There is a long beach, mainly full of small stones. There is a pier, which contains mainly cafes and shops. Swimming and surfing are possible, but the water is cold and currents can be strong. - The Old Town is the prettiest part. It includes many galleries and interesting buildings and shops. The area is popular with artists, poets and writers. - There is a small fishing port. Fresh fish can be bought locally, and there are many shops selling fish and chips. There are beautiful views from the surrounding hills, which you can see by walking or taking the cliff railways up the East or West hills. The main road through the town can be busy, creating some noise and air pollution. 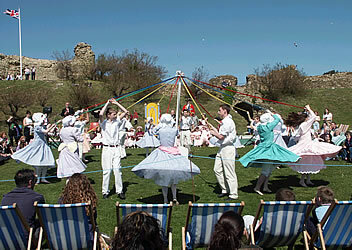 South England is more sunny than other parts of the country, but by the coast there can be strong winds. There are many seagulls. There is some begging, drunken behaviour and drug-related crime, mainly around the town centre. Many asylum seekers (refugees) have been given homes in Hastings. The town suffered decline over recent years and has a high rate of unemployment, but recently much has been done to regenerate the area. Operation Columbus is a campaign by Sussex Police which tries to help visiting students to stay safe: see http://www.sussex.police.uk/youth/columbus. Because there are a large number of language school students arriving in July and August, there can be some tensions with local people at this time of year. In 2001/02 there were 26.9 offences of violence against people per 1,000 people, much higher than the English average of 10.8. 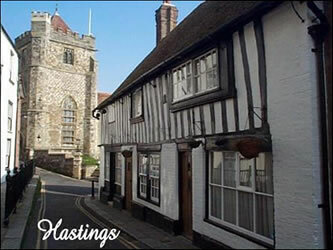 In 2000, Hastings was ranked the 27th most deprived out of the 354 districts in England. There is one theatre (the White Rock), but it has financial troubles. Bus: Bus services can be crowded in summer months, and are not frequent in the evenings. Train: There are 4 railway stations in the area (Hastings is the main station; the others are West St Leonards, St Leonards Warrior Square and Ore). The train lines lead to London, Ashford (in Kent) and Eastbourne. Bicycle: There are some bicycle paths by the sea front, but the main road is busy and the inland area is hilly.